An easy and hassle-free way to bypass ExpressVPN's 'three simultaneous connection' limit and enable VPN protection for all your devices. Setting up and using a VPN at home can take a lot of work. You'll need to install apps for desktops and mobile devices, figure out how to use them, then follow lengthy tutorials to get up smart TVs, games consoles, Chromebooks and anything else you'd like to protect. That's just the start. Most VPNs limit the number of simultaneous connections they'll support, sometimes to as few as three, and when you hit that maximum, any other devices will stop working. The simplest way to avoid these issues is to set up your VPN on a router. 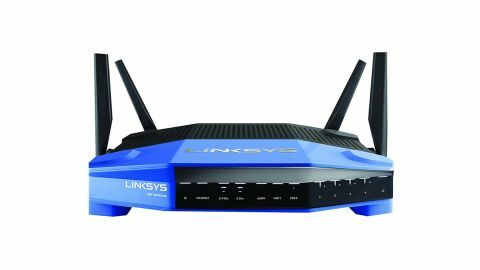 Your devices can then connect to the router's wireless network as usual, with no need to install VPN apps or get involved with complicated manual setups. And no matter how many devices connect to your router, it's only making a single connection to the VPN, so you'll never hit any device limit. Not every router can be set up this way, and even compatible routers aren't always straightforward. Just setting up VPN locations, for instance, will probably involve downloading and configuring one file for every server you want to use. This means there's no firmware to download, no manual server setup required, you don't even after to remember your user name and password. FlashRouters can preset the router for your ExpressVPN account, or you can easily do this during setup, and it'll be ready to use immediately. Pricing is reasonable at $249.99, especially as this gets you both a one-year warranty and FlashRouters' Basic support plan. Despite the name, this doesn't seem too 'basic' to us: you get three months email support to help set up your wireless network, internet access and simple VPN integration, as well as one remote support session to troubleshoot tricky issues. If you need more, an extra $25 gets you help you for a full year, covers more advanced issues, and includes two remote support sessions. It takes a lot of power to handle the VPN needs for an entire household, but the WRT3200ACM's MU-MIMO technology allows it to communicate with multiple devices at once, while support for Tri-Stream 160 technology enables operations at 160MHz, doubling the bandwidth of lesser 80MHz hardware. The router can't compete with ExpressVPN's apps for configurability, but you do get the ability to switch between OpenVPN UDP connections for speed, or TCP for reliability. If your top priority is unblocking Netflix or other websites, you might be more interested in the router's support for ExpressVPN MediaStreamer. It's a clever DNS system which could enable accessing geoblocked content without the performance overhead of using a VPN. You don't need many instructions, fortunately, as setup is very easy. Connect the WRT3200ACM to your modem if it's going to be your main router, or your existing router if it's a secondary device, plug in the power and turn the router on. You're then able to access the router management page by pointing your browser at www.expressvpnrouter.com, or default IP address (192.168.42.1). The manual includes the user name and password you'll need to log in. If you gave FlashRouters your ExpressVPN activation code when you purchased the router, it should be tied to your account already. If not, you're prompted to sign in to the ExpressVPN website, and copy and paste the activation code into the router setup page. The code links the router to your account without the need to enter a user name, password, email address or anything else, and setup is complete. VPN routers don't get much easier than this. Click your preferred location and the router connects to that service. You're able to switch to another location at any time, or disconnect entirely if you prefer. An interesting Manage Devices screen allows you to decide how your devices access the internet. You can set every device to be protected by ExpressVPN with a single click, but it's also possible to treat each device individually. For example, you could set your Smart TVs and games consoles to use MediaStreamer for video unblocking, have your desktop and tablet protected by ExpressVPN, but leave your laptop to connect directly (without the VPN), perhaps because it's already set up with a VPN app of its own. Once you've configured your own hardware, you can set a default action to apply to any new devices. If you'd like visitors to be able to use your wifi, but not the VPN, for instance, you can configure new devices to bypass the tunnel and connect directly to your internet connection. It's all very flexible and convenient. Assessing the performance of a VPN on a wireless router is difficult, as there are so many variables involved, but we ran some basic checks to get an idea of the WRT3200ACM's abilities. We ended the review on a positive note, by checking ExpressVPN's website unblocking credentials. Accessing geographically restricted sites like BBC iPlayer and US Netflix can be a challenge, even for some of the best VPNs, but not here-- ExpressVPN got us into both sites, with the full VPN and with its MediaStreamer.